Today I made this centerpiece for my Thanksgiving table tomorrow. I know it looks more Christmas-y than harvest-y, but that means I can use it all month! It was so easy, so I thought I would pass the idea along. Cover each cone with the sheet moss, using the floral pins. If any of the pins are obviously noticeable, you can easily cover it by gluing on a bit of leftover moss. Using the floral pins to attach at either end, wrap the two small trees with the beads. 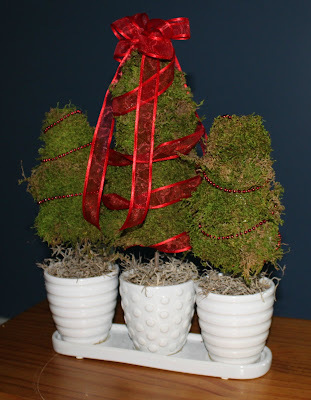 Wrap the larger tree with the ribbon and then make a bow for the top of it, letting the tails hang down over the side. Put a twig in the bottom of each cone and then put the twig into the floral foam, using hot glue. If the twig moves around or the hole ends up being too big, use some twig leftovers to shimmy it a bit. After the trees are in and straightened, cover the openings with the Spanish moss, hot gluing it in place and trimming off any straggling pieces. There you go! Easy and elegant! p.s. this is part of the blog hop over at Frugally Sustainable. Check it out here.